Lee Baisden's mother described him as "one of a kind" and said his loss had "left a massive hole" in the lives of all those who knew him. The 34-year-old, who lived in Romford, Essex, had worked as an accountant for the London fire service for 18 months, and used the Tube every day to get to his office in Westminster. On the morning of 7 July, he left home an hour later than usual - a decision which put him on a Circle line train with Shezhad Tanweer. Mr Baisden was the closest person to the bomber and is thought to have been killed instantly when he detonated his device. Nicknamed Bazza since childhood, Mr Baisden spent much of his time outside work caring for his mother Denise, who is a widow and suffers from multiple sclerosis. 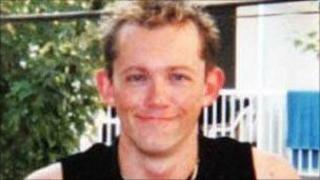 "Over the years, Lee's love and commitment to his family never faltered," she told the inquest in a statement. "His love and support made life so much easier for me and I miss his companionship." Mr Baisden's family said he loved music, animals, reading and travel, and had been planning a trip to Greece with his partner of three years, Paul, when he was killed. "Lee was a brave person and did not have any strong political beliefs," his mother said. "He was bright and could have achieved so much in his life. "He planned to get married to his partner, Paul Groman, and he enjoyed life to the full. "He was loyal, sensitive, trustworthy and caring. We will remember him as a fun-loving man who could be stubborn at times. "Lee was somebody who never liked to be the centre of attention and would always shy away from having his photograph taken, but this was one of his endearing qualities." Mr Baisden's colleagues at the London fire service also paid tribute to him, describing him as "friendly, conscientious and hard working".